“Toronto, we are here. We are not invisible,” announces Nicole Flynn, 20, gold medalist of the Down Syndrome International Swimming Competition in 2012. 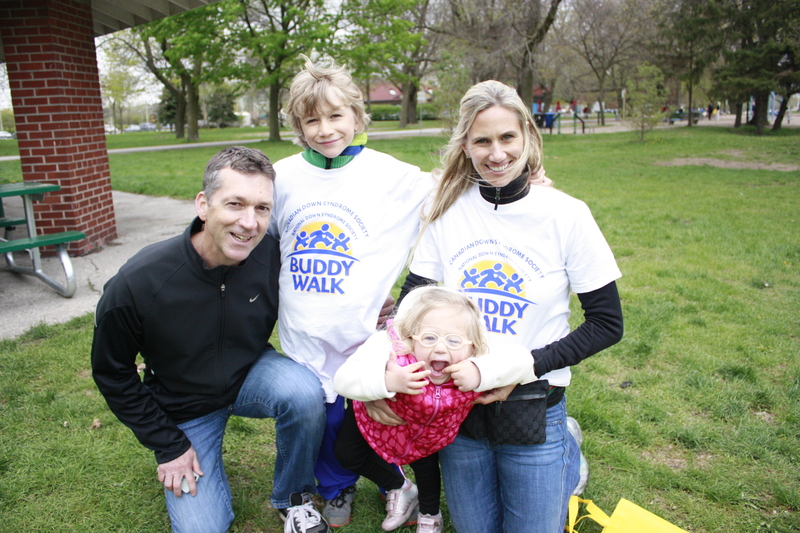 With this vigorous, mighty statement, Flynn helped kick off the first Annual Buddy Walk in Toronto on May 11th at Woodbine/Ashbridges Bay Park. 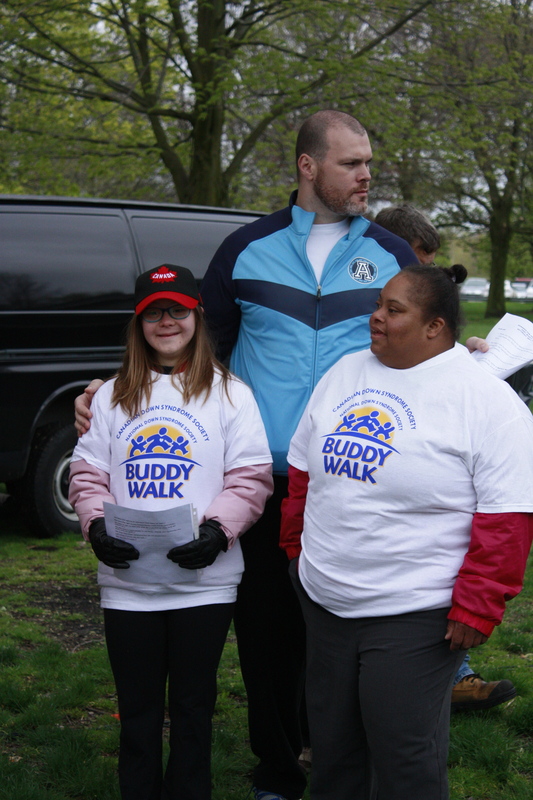 Held by the Down Syndrome Association of Toronto, the walk is in line with a rapidly growing movement of Buddy Walks held in over 300 cities worldwide, ever since it was established in 1995 by the National Down Syndrome Society in the United States. 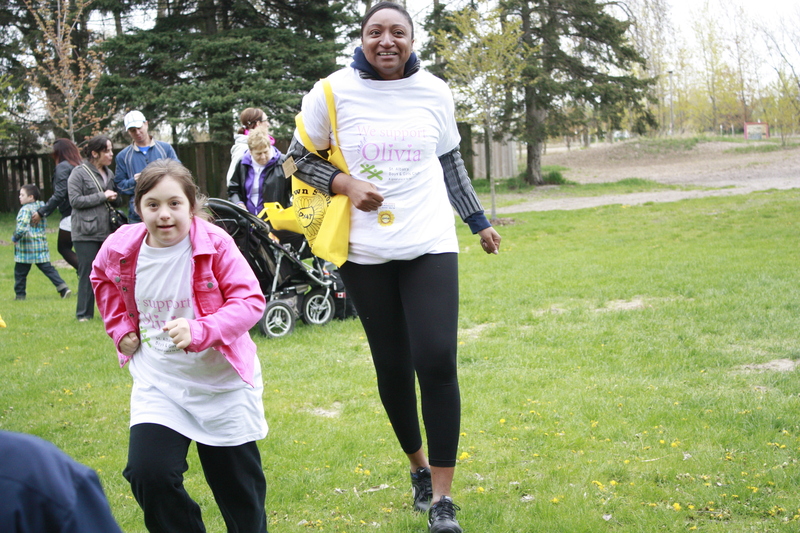 Over 330 participants and volunteers showed up at the event and the majority of them attended with close family members who have Down syndrome. The event was packed with team-building activities, which included a photo-taking station with professional photographer Trina Hoadley, a yoga warm-up session and fundraising prizes to the teams who raised the most donations. Compelling speeches pumped up the large crowd that huddled in front of the podium. Speaker Nicole Flynn was not only a synchronized swimming gold medalist, but she has also been awarded the Queen Elizabeth Second Jubilee medal with her 15 years of volunteer public speaking and the Duke of Edinburgh Award. She has acted in 3 community musical theatre productions and has been training for a sprint-level triathlon while also completing her grade 12 high school diploma. In her speech “Powered by an extra chromosome”, she boldly declared that people with Down syndrome have way more potential than the common perception. 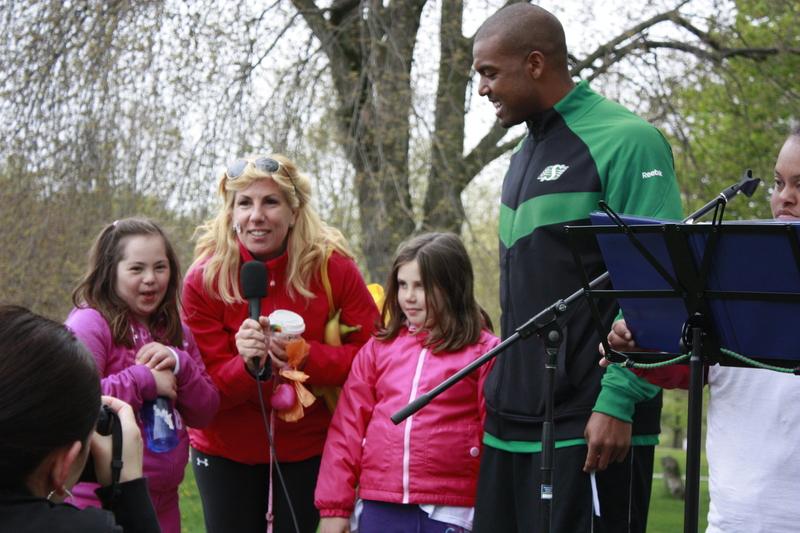 Adriano Belli, Retired CFL & NFL Football player and 2012 Grey Cup Winner followed that up with a spirited introduction to his fellow CFL footballer Tristan Black and Black’s sister Cassandra who has Down syndrome. Black introduced his sister with a warm sense of humour. 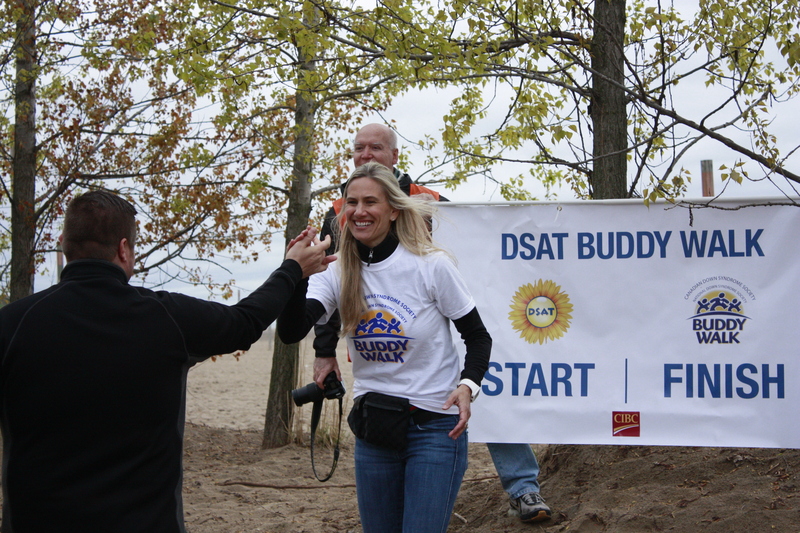 Down Syndrome Association of Toronto Board Member Stephanie Myer high-fiving participants at the Buddy Walk starting point. 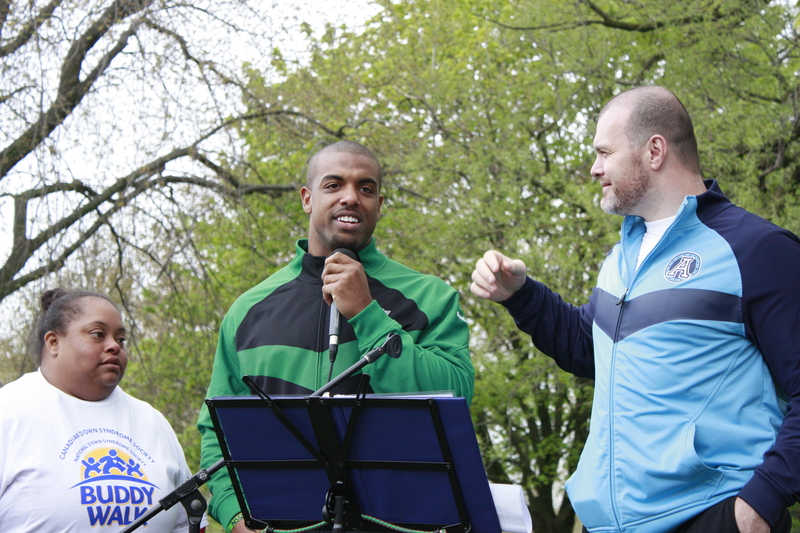 What was truly heartwarming though were the participants’s stories and the reasons why they came out to the Buddy Walk. Barry Adams came with his grown-up daughter Mariana who has Down syndrome to show solidarity and concern for those affected by the disorder. Father and daughter: Barry Adams and Mariana Adams sharing a hug at Toronto’s 1st Annual Buddy Walk. 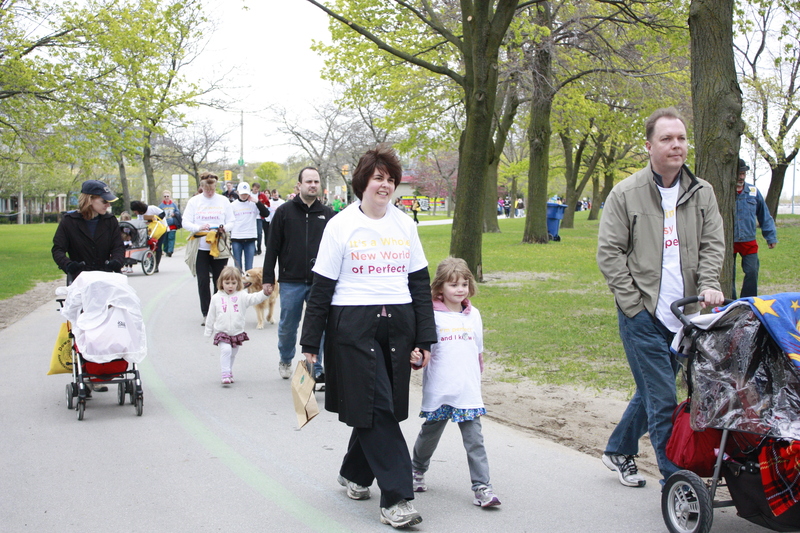 Participants supported the Buddy Walk held by the Down Syndrome Association of Toronto with family and friends. 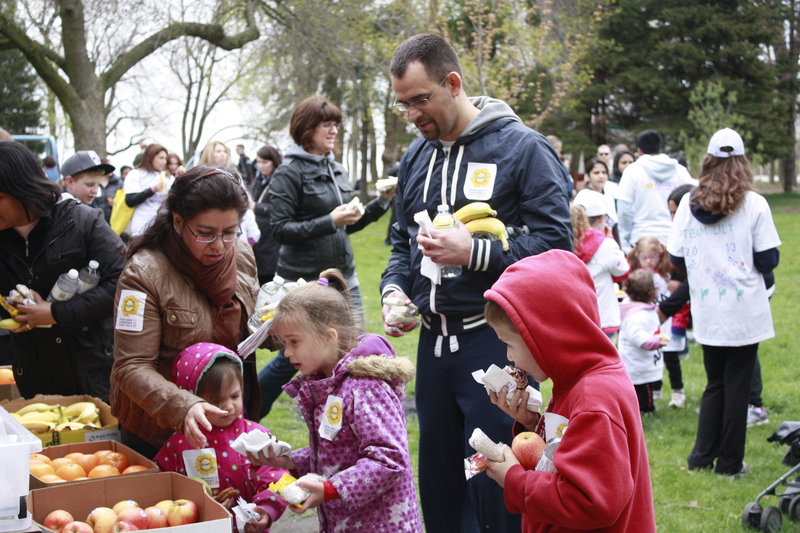 The event was packed with family activities, including a variety of picnic foods to choose from for lunch and recreational times in the park playground. Another family of 4, Matt, Grace, Madison and Zoie Levlin formed Team Madison, where the parents and sister support little Madison, who is not shy in declaring, “I’m here because I have Down syndrome!” Madison’s father Matt Levlin commented on the lack of funding and support for parents with children who have Down syndrome. Madison’s mother Grace Levlin also raised her concern of Toronto dragging behind in terms of having awareness of people with Down syndrome. 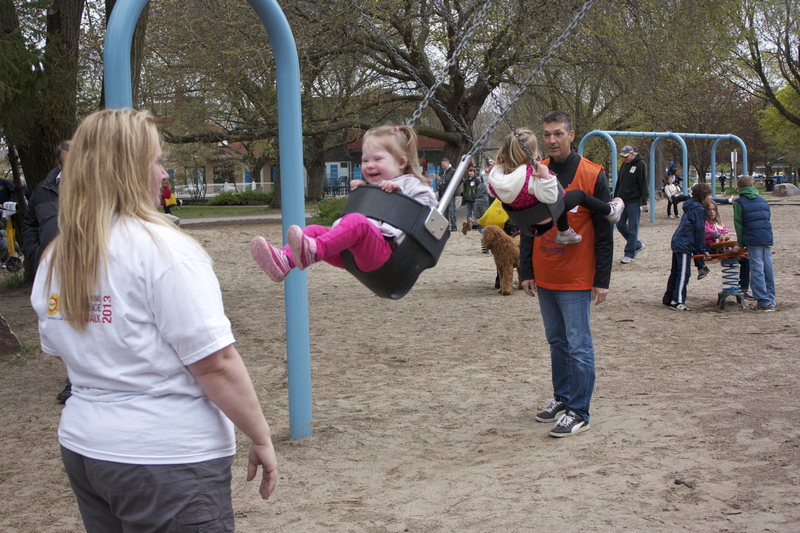 One of the major organizers and host for the event DSAT board member Stephanie Myers’s own 5-year-old daughter Monika is affected by Down syndrome. She has been involved with the organization since her daughter was at a very young age. 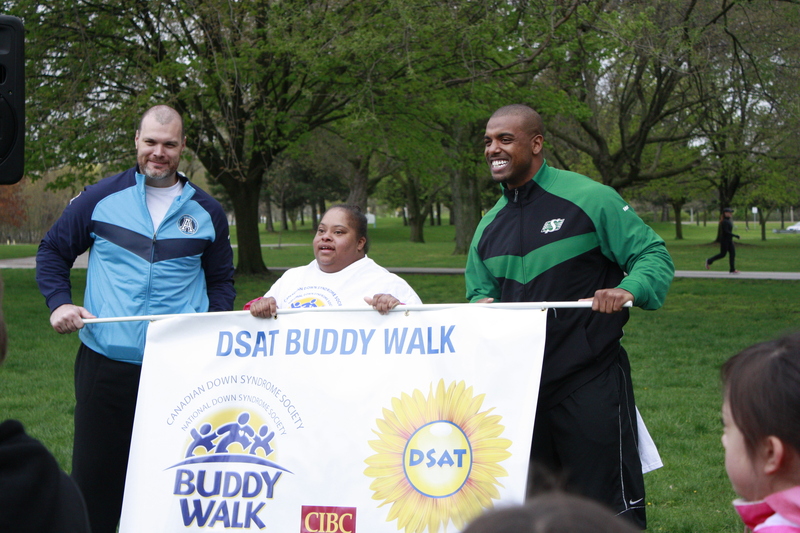 Toronto’s first annual Buddy Walk has surpassed its goal of raising $50,000 by a total of $52,408.31, which will go towards DSAT’s community programming for the year. The organization also offers job placement services, summer camps, community picnics, seminars and workshops for families of children with Down syndrome. Do you have a family member or friend who has down syndrome? What do you think is most needed for this community of people with special needs: education, support or opportunities? Share what you think by leaving your reply in the comments box below! has written 15 articles for Enabled Kids.